Members of the Hartford Area Local were joined by labor allies for a rally to Save American’s Postal Service on Oct. 24. Lori Pelletier, executive secretary-treasurer of the Connecticut State AFL-CIO; Rene Morissette, president of National Postal Mail Handlers Union Local 301; John Olesen, Branch President of LiUNA Local 301; members of the Greater Hartford Labor Council, and Sen. Richard Blumenthal (D-CT) were on hand to help distribute APWU informational flyers to the public, as well as to collect 75 “I Stand with Postal Workers” postcards. Long Island Area Local Rallies for Good Postal Service! Good Jobs! Good Contract! More than 150 members of the Long Island Area Local and their supporters rallied for Good Postal Service! Good Jobs! Good Contract! at a demonstration in front of the Mid-Island general mail facility in Melville, NY, on Nov. 1. Protesters informed the public about the fight for a good contract, called for the reversal of degraded service standards that went into effect on Jan. 5, and demanded an end to the shady deal between the Postal Service and Staples. Read more about Long Island Area Local Rallies for Good Postal Service! Good Jobs! Good Contract! 10/28/2015 - The legislative movement against delayed mail achieved an important milestone over the past week. For the first time, an outright majority of the Republican-controlled House of Representatives is now calling for an end to delayed mail and the return of overnight mail standards. This accomplishment is building on the overwhelming and bipartisan 85-11 Senate vote in April against postal cuts. Over the last week, 3 Republicans and 3 Democrats have signed on as co-sponsors of House Resolution 54 (H.Res.54), which now has 219 co-sponsors in total. Led by Reps. David McKinley (R-WV) and Paul Tonko (D-NY), H.Res.54 calls on the USPS to restore mail restore service standards to those in effect from July 1, 2012 – January 4, 2015. The latest cosponsors are demonstrative of the broad coalition demanding prompt service: Democrats and Republicans, urban and rural, committee chairs and congressional newcomers. 10/19/2015 - APWU predictions that lower service standards would wreak havoc on mail delivery were substantiated in a “Management Alert” issued by the USPS Office of Inspector General (OIG) on Aug. 13. According to the alert, the Postal Service failed to meet even the degraded service standards management implemented on Jan. 5, 2015. The amount of mail that failed to meet delivery targets in the first six months of the year increased 48 percent over the same period last year – despite the new, more relaxed standards. 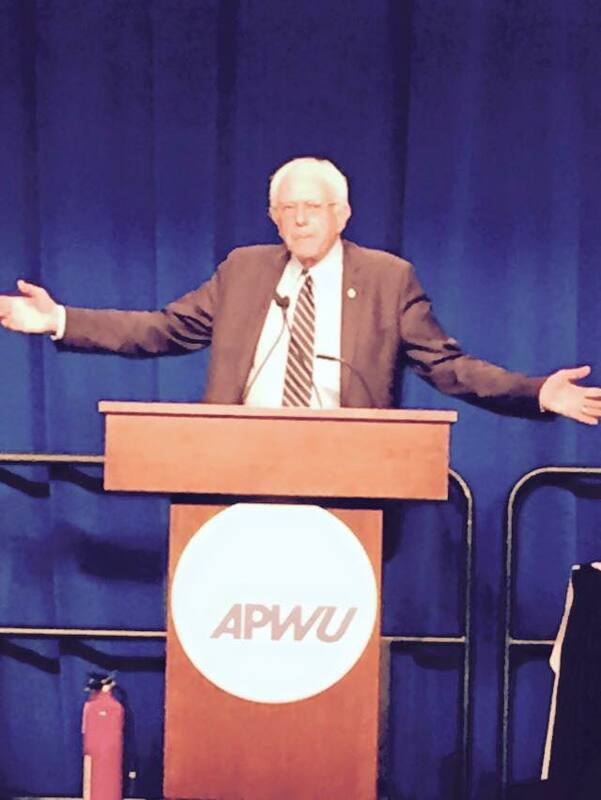 Presidential candidate Bernie Sanders thrilled APWU members attending the union’s All-Craft Conference in Las Vegas on Oct. 14. Front row: Madison Area Local President Bret Wersland; Chris Czubakowski, associate editor Milwaukee Area Local; JJ Johnson Heiss and Karen Deloof, Madison Area Local; Valerie Landowski, Regional Coordinator Northeast Wisconsin AFL-CIO.Back row: John Nichols, writer, commentator; Bernie Faust Wisconsin Alliance for Retired Americans; APWU of Wisconsin President Steve Lord; Booth visitor; APWU President Mark Dimondstein, John Miceli, editor Milwaukee Area Local; Cathy Carobine; APWU Nat’l. Postal Press Assoc. President Tony Carobine. Named for one of Wisconsin’s best-known politicians, the annual Fighting Bob Fest has become one the nation’s largest progressive gatherings. 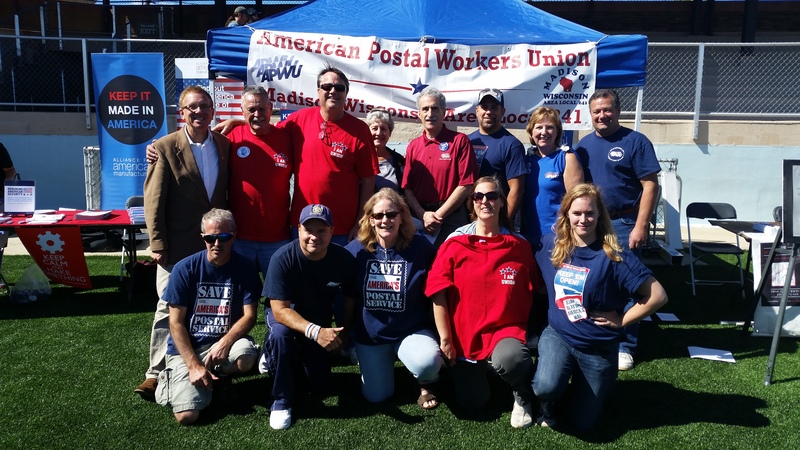 This year’s celebration, held in Madison on Sept. 19, was no exception – and APWU members seized the opportunity to win support for the fight to save our public Postal Service. 09/15/2015 - The APWU filed a brief in D.C. Circuit Court on Sept. 14 against the Postal Regulatory Commission (PRC), arguing that USPS service standards must be “legally enforceable.” In 2013, the union filed a complaint with the commission asserting that the Postal Service was systematically violating service standards as a result of plant closures. To avoid addressing the complaint, the PRC concluded that service regulations are unenforceable. Contrary to all past pronouncements, the commission declared that service standards couldn’t be “violated” in any legally meaningful sense.